Sergey Sheremetyev. Photo(c): Elizaveta Pestova / Mediazona. All rights reserved.This article originally appeared in Russian at MediaZona. We are grateful for their permission to publish a translation of it here. By regional standards, the Kemerovo coal basin in southwestern Siberia (also known as the Kuzbas), is considered an industrially developed and heavily populated area. Its governor and local kingpin Aman Tuleyev has been dubbed by the press as both “the most effective governor in Siberia” and “one of the most authoritarian regional leaders in Russia”. He’s even been called “head of the Kuzbas Khanate”. 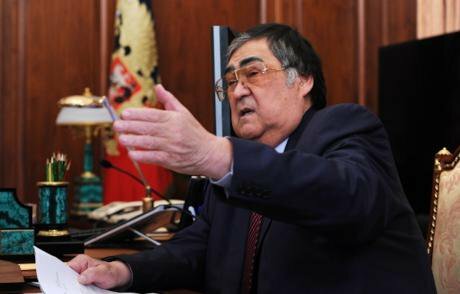 Tuleyev, 73, isn’t Russia’s longest serving governor (Yevgeny Savchenko has governed the southern region of Belgorod for 24 years), but he is definitely top dog. Tuleyev is just a year younger than his region, which was carved out of the Novosibirsk region in 1943: with the Donbas and its coal reserves occupied by German troops, the Kuzbas became critically important to the Soviet Union as a source of fuel. The scale of mining here has grown incrementally ever since. Spichenkovo airport lies 25 km from the city of Novokuznetsk. The road is lined with private houses and large black hills — slag heaps left after the open cast mining of the area. The surface layer of soil is removed by bulldozers, revealing barren rock which is then crushed by powerful machines to expose the coal beneath. The waste rock, known as “tailings” is then piled into heaps. This method of coal mining has only been in use in Russia for the last 10-15 years: in Soviet times coal was extracted from deep mines. The landscape around Novokuznetsk, seen from a plane, is like nothing on earth, its fields broken up by the enormous gray quarries, sometimes kilometres wide and up to 200m deep, left after the coal has been extracted. The regional government and its loyal press don’t talk about the dangerous proximity of this mining activity to the towns of the area. Governor Tuleyev constantly sings the praises of the coal industry, which increased its output by 9% this year. So far, the only people to protest are the residents of the villages threatened by the sprawl of the mines: Sergey Sheremetyev from Alekseyevka and a few allies succeeded in halting operations by the Bungursky-Severny Excavation Company, a kilometre away from a residential area (rock fragments from the blasts were landing in people’s gardens). Mining was also halted in the picturesque village of Apanas, on the edge of the taiga. “We fought them from 2010 until 2013,” says Sheremetyev. “We used all kinds of tactics: we lay under the excavators’ caterpillar tracks, we entered the explosion zone, we stopped them loading coal, and of course we wrote protest letters. Either we don’t live here, or they don’t mine — there are no other options.” To my question about whether they had tried to dissuade or intimidate him, Sheremetyev just smiles and says it’s hopeless. Now activists from Ananyino and Alekseyevka have started sharing their experiences with other people. 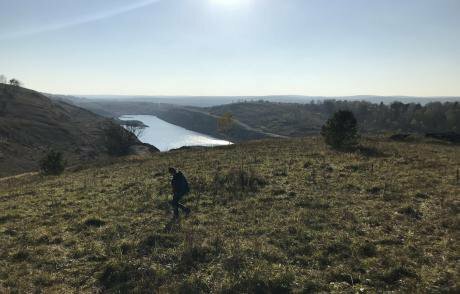 They recently organised a protest on the occasion of Russia’s Year of the Environment, planting fir and cedar trees around the edge of an old open cast mine, and releasing young carp into the water that now fills it. In early October, the protesters gathered in Gavrilovka, a village of 20 houses near Novokuznetsk. 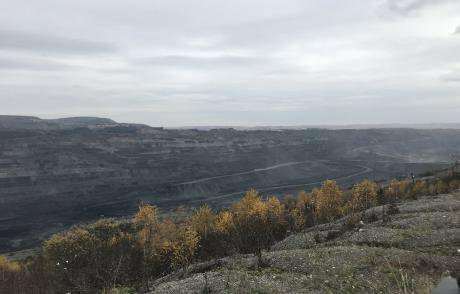 Five kilometres away, coal is being mined at the Stepanovsky open cast site — without the necessary documents, activists claim. Residents of other villages unhappy with what was going on joined those from Gavrilovka to protest. The activists planned to block the road leading to the excavation site with a bulldozer, but at the last moment the people from Gavrilovka decided against it. Sheremetyev tells me that the night before, trucks arrived with free coal and villagers were promised that the one and only road in the village would be mended. In the end, a sparsely attended rally did take place, ending with the signing of a collective letter to the law enforcement bodies, demanding an official inspection of the Stepanovsky site. The site manager then admitted that not all the necessary formalities had been completed, but the local authority ruled that operations there were perfectly legal. Critics of the region’s coal industry are often reminded by the authorities that the mining operations provide jobs for the local population, says Anton Lemetuyev. Some 150,000 of the Kemerovo region’s 2.5m inhabitants are directly involved in the mining sector, and others work in its infrastructure and numerous industries connected with it. Lemetuyev tells me that the wages of many people living in the region “are linked to the amount of coal extracted and sold”. 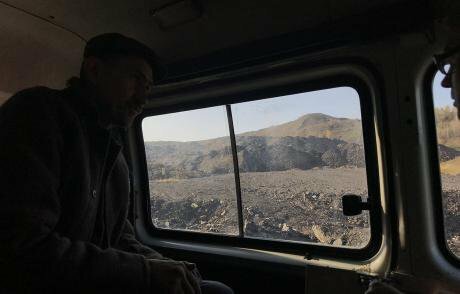 “I’d rather find work 100km away than work in the mines,” Sheremetyev tells me with disgust. He works as a minibus driver in Novokuznetsk. Lementuyev calls Kuzbas a “mono-region”: it seems to consist entirely of mine-towns, quarry-towns and power plant-towns. Official figures put the number of open cast mines at 120, but it’s difficult to work out the real figure: environmentalists believe there are quite a few sites where mining continues illegally. There are 10 open cast mines in Kiselevsk, a district with 90,000 inhabitants. The quarry edges sometimes come right up to houses: like where English teacher Svetlana Kolomeychenko lives. Most houses in her street were demolished long ago, but Svetlana refuses to sell her plot to the mining company; she feels the compensation being offered is inadequate. Behind the trees in her back garden is a steep drop, and beyond the drop is a disused open cast mine, where smoke rises from the coal from time to time. The windows of her house are always coated in a layer of black dust. She has a tear-off calendar where she notes the blasts: “25 September, 14.45: the explosions are quiet today, in honour of the Feast of the Birth of the Holy Mother of God.” More powerful explosions produce cracks in her walls. Bachatsky open cast mine. Photo(c): Elizaveta Pestova / Mediazona. 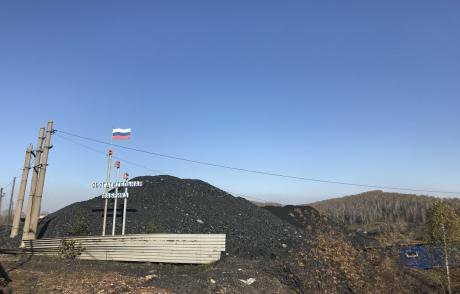 All rights reserved.Near Belovo, a town of 70,000 people 100km from Novokuznetsk, is the Bachatsky open cast mine, the largest in the region, which has produced several million tonnes of coal since 1949. The pit is 250m deep, black dust rises from it constantly and the massive BelAZ dump trucks look like children’s toys in its lifeless landscape. Ecodefense campaigner Vladimir Slivyak believes that the Kemerovo region is on the brink of an environmental disaster and social disintegration. The mining industry has been in decline for several years and the EU countries signing the Paris climate agreement in 2016 committed themselves to reducing their use of coal and phasing it out completely in the near future, leaving major coal producers with a financial shortfall. Anton Lementuyev believes the local mining corporations are aware of the situation, but continue to operate with impunity thanks to sweeteners from the regional government: “they have no social responsibilities, which avoids a huge amount of outlay: they have abandoned any responsibility for rehousing, environmental obligations or just observing the law. Everything has been rigged to allow them to avoid paying for anything.” Thus, legal requirements are ignored so that firms can open mines near population centres, and the land is never cultivated afterwards. According to Lemetuyev, this is because opencast mining is cheaper, and by excavating near towns and villages they save a fortune on infrastructure. “Everything comes down to mining company profits,” concludes Slivyak. In the European part of Russia, Vladimir Slivyak tells me, coal accounts for only a small part of our energy use, “but Siberia and the Far East are a totally different story”: coal provides about 50% of energy here. “So environmentally-minded conversations about having to do something — lower waste emissions, develop different energy sources — are bad news in Kuzbass, because we’re so reliant on coal,” Slivyak adds that most houses in the region still use it for heating, and the government is in no hurry to lay gas pipelines to replace it. According to environmental specialists’ figures, one and a half million tonnes of pollutants and about half a million cubic metres of contaminated effluents are annually released into the environment in Kuzbas. Anton Lemetuyev of Ecodefense gives me an example: over the last few years the water in the river Aba, which flows through the centre of Novokuznetsk, has turned black. And 300-350 tonnes of redundant rock are annually deposited next to open cast mines — this waste occupies a large area and, according to environmentalists, is toxic. The cut in Alekseyevka. Photo(c): Elizaveta Pestova / Mediazona. All rights reserved.Coal for the Kuzbas also has an effect on the environment of other parts of Russia. In the far eastern ports of Vanino, Sovietskaya Gavan and Nakhodka, for example, a tense situation has arisen over coal shipments. The port workers unload coal in the open, releasing toxic dust into the air. The environmentalists explain that, as far as atmospheric pollution is concerned, the local residents may as well be living in an open cast mine. Local campaigners are trying to get a ban on the open shipment of coal, but so far with little success.